Fantastic Sunset Wedding at the House of Refuge. 3/9/17: Always a favorite shot Taken at The House of Refuge in Stuart Florida, Florida. These sorts of sunset photos almost become routine at the House of Refuge. Here we chose to expose this shot as a silhouette. Showing off the magnificent sunset over the dock that extends into the indian river. Many folks forget that right across the street from the beach setting that most think about when discussing the house of refuge museum, lies yet another whole set of great photo opportunities. Particularly rare on the treasure coast, are any waterfront wedding venues facing west..which is rather odd when you think about it. But really you have the house of refuge, pietros on the river, and The santa lucia riverclub as really the only options where a sunset on the water scenario is even possible. Typically we not only shoot with natural light as in this shot, but we take complete control over our imagery, and for that reason, we'll have a complete professional lighting set up out there with us so in addition to natural light, we can augment as needed to deliver a set of images that no other company in the area can match. 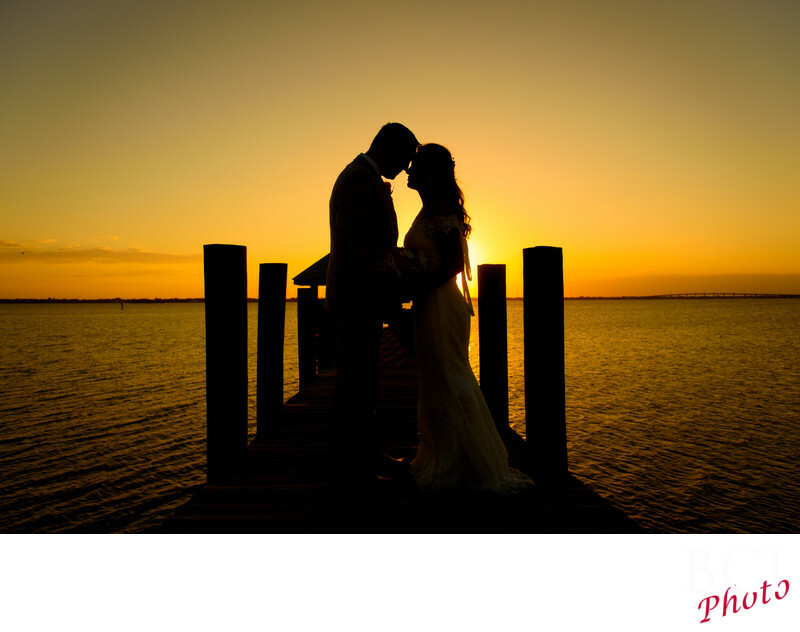 That's our goal...to deliver to you, the best wedding photography you've ever seen period! With you as the subjects.